Autograph Letter Signed ('R. Brimley Johnson') [to Swan Sonnenschein], proposing a work for publication, and outlining his literary achievements. 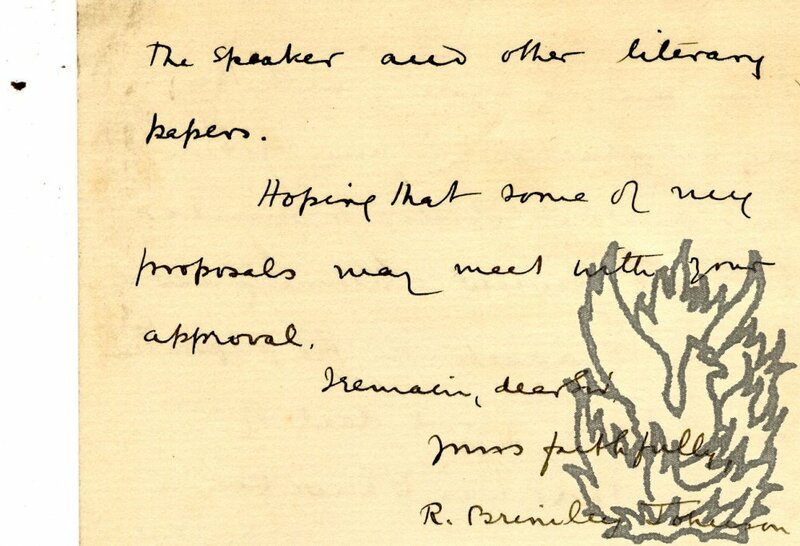 19 February 1893; on embossed letterhead of Llandaff House, Cambridge. 12mo, 4 pp. Bifolium. Good, on lightly-aged paper. He was introduced to the recipient 'by Mr. Philip Malleson of Croydon, when I wanted to send an Essay to The Albemarle'. Asks if he 'might be disposed to let me write a volume on Jane Austen or Leigh Hunt for your Dilettante Library', Austen being 'specially before the public just now'. He has edited Austen's novels and two 'well received' volumes of selections from Hunt for 'Mr. Dent's Temple Library'. 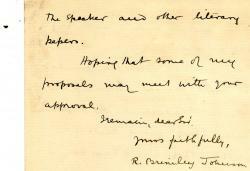 'If you do not care to arrange for either of these authors I would suggest Miss Burney[,] Hazlitt or T. L. Peacock. I have now in the press a reprint of Evelina and a volume of selections from Hazlitt's Spirit of the Age, for both of which I have studied these writers in all their works.' Lists material he is sending relating to his work. 'I may mention that I have also edited the Poems of Prior and Samuel Butler for the Aldine reissues, which are, in these cases, practically new editions, and have contributed to the Academy, The Speaker and other literary papers. Johnson's proposal was accepted: Swan Sonnenschein published his selection from Leigh Hunt in their Dilettante Library in 1896.